These days, given his creations’ presence on television for more than half a century, most people are familiar with Jim Henson. But in 1977, when the Muppets were just starting to get global recognition, the man behind them was rarely seen. An occasional talk show appearance put Jim before the camera, but it would be more than ten years before he hosted his own show and really began to have a visible public persona. 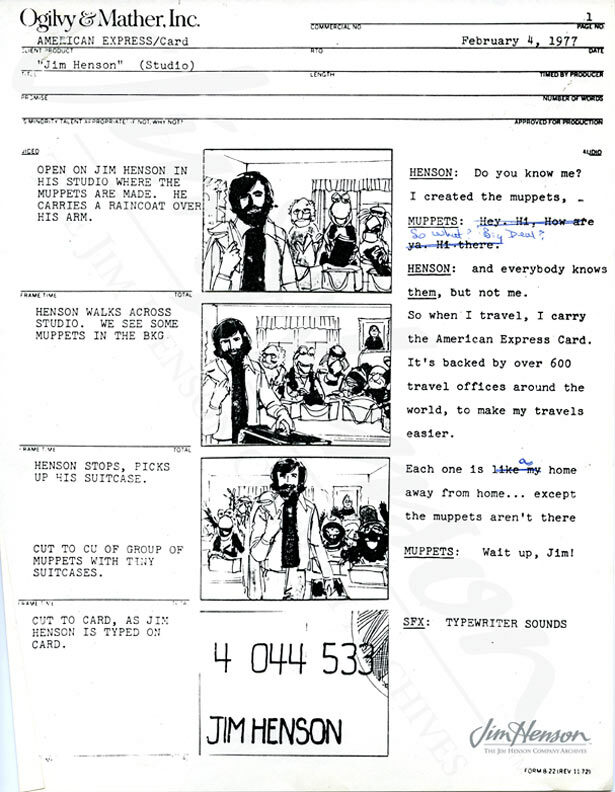 He was a perfect celebrity for the American Express “Do You Know Me?” advertising campaign orchestrated by the Ogilvy & Mather agency in the 1970s. In the 1950s and 1960s, Jim shot hundreds of television commercials with his characters in the salesman role, but this was the first time Jim was doing the selling as himself. He and Richard Hunt, Jerry Nelson, Dave Goelz, John Lovelady and Frank Oz headed uptown to a studio on East 95th Street for the shoot. 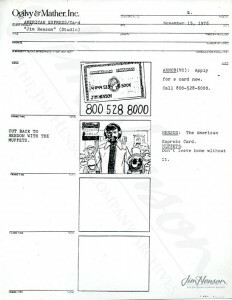 A pre-production meeting was set for the day before, and the commercial was shot in one day. On screen, after being heckled by an array of characters, Jim promised that he wouldn’t leave home without his American Express card. And for the record, he even signed an affidavit confirming that his experience using the card matched his statements in the commercial. It was fun for Jim and gratifying to be in the same limelight as other “Do you know me?” celebrities. Later that summer, Ogilvy & Mather made a composite commercial to air during the Westchester Golf Classic featuring short bits from their ads with such luminaries as Benny Goodman, Bill Blass, Joe Morgan, Sam Ervin, Bob Fosse, Mel Blanc, and Jim Henson. 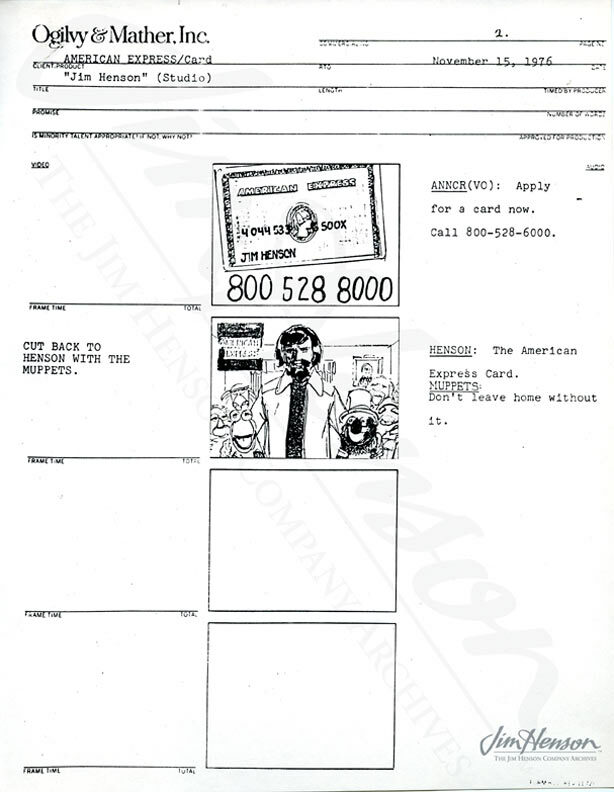 Jim’s commercial – and celebrity – was clearly enduring. 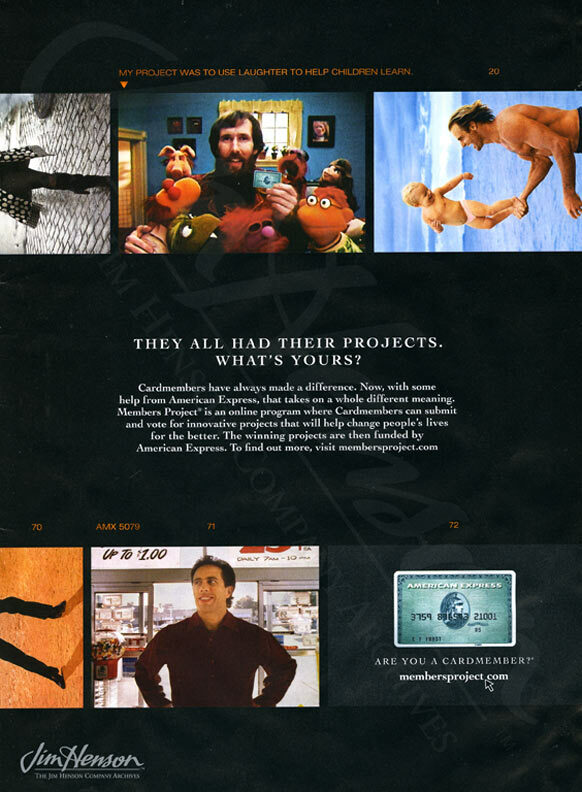 When Amex revived these commercials to promote their “Members Project” campaign in 2008, Jim’s commercial made the cut. 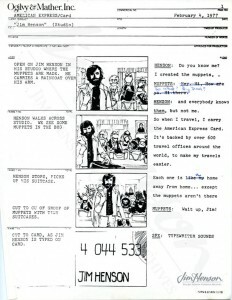 Storyboard for American Express commercial featuring Jim Henson, 1977. 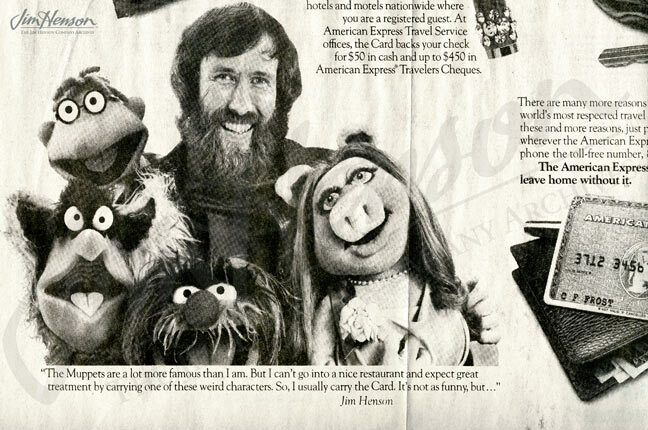 Print advertisement featuring Jim Henson for American Express, 1977. Jim featured in an Amex print ad for their Members Project campaign, 2008. This entry was posted in 02-February '77, 1977, Commercials and tagged American Express, Benny Goodman, Bill Blass, Bob Fosse, Dave Goelz, Frank Oz, Jerry Nelson, Joe Morgan, John Lovelady, Mel Blanc, Muppets, Richard Hunt, Sam Ervin. Bookmark the permalink.